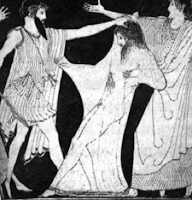 When Clytemnestra welcomes Agamemnon back to Argos, she tells the servants to roll out the red carpet for his entrance into the palace. He balks - for several reasons. Such delicacies are womanish; not suitable for a soldier used to camp life. He does not want to be fawned over like some eastern potentate. This kind of display is more fitting for a god than a man; and Agamemnon is anxious not to invite divine jealousy. Being mortal, he thinks it dangerous to set foot on fineries. Besides, it is unnecessary. He wants to avoid such foolishness. Clytemnestra is not to be denied, despite Agamemnon's resolve to do nothing against his will. She hints that he has spoken from fear. "What would Priam have done, if he had been victorious?" Clytemnestra asks. "He probably would have walked on the tapestries," Agamemnon replies. "Then why worry about what people might say?" she asks. "Because the people's voice is powerful,' he answers. She presses on. "Anyone worthy of admiration is the subject of envy." Agamemnon has had enough of her combativeness and tells her to give up, but Clytemnestra reminds him that victors can afford to be gracious. "Does winning mean so much to you?" he asks, walking right into her trap. "I know you don't have to," she says, "but let me win just this once."